A graded marathon stakes race highlighted a marathon card pf racing which wrapped up 2016 at Woodbine. The fields were large and thus the betting was enthusiastic – handle on the final card of 133-day meet was a record for curtain-closing programme, as $7,435,983 was wagered, shattering the 2015 mark of $6,546,737. Bangkok, a 17-1 longshot, wore down defending champ Melmich in the late going to take Sunday’s Grade 3, $150,000 Valedictory Stakes, the final stakes event of Woodbine’s 2016 thoroughbred racing season. It was a gutsy effort by the Street Hero gelding and winning rider Emma-Jayne Wilson, as the duo rallied stoutly down the lane to best 2-5 mutuel favourite Melmich, and in doing so, netted the bay his first added-money score. Ethical Funds was third. Bangkok stopped the teletimer in 2:59.88. The Beyer Figure was 86. 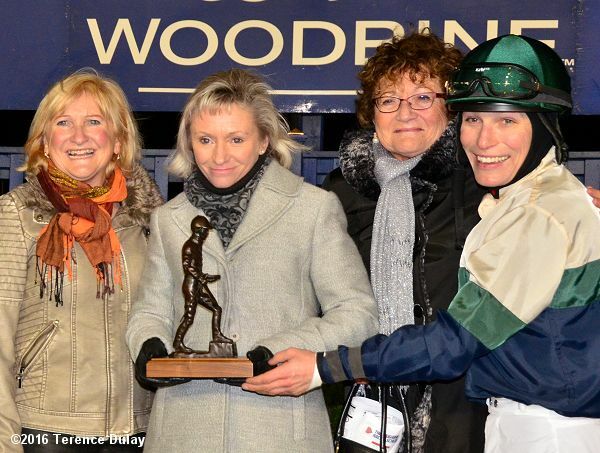 Trained by Phil Gracey for owner-breeders Gail Wood and Dr. Ruth Barbour, the Ontario-bred now has four wins from 25 career starts. It was the first stakes appearance for the five-year-old since a fourth-place finish in the 2014 Breeders’, third jewel in the Canadian Triple Crown series. It was Decision Day who took early control of the 1 ¾-mile feature, with Ethical Funds tracking in second, as Bangkok settled in third with Melmich just to his outside. After opening splits of :26.31 and :52:23, leading jockey Eurico Rosa da Silva and Melmich confronted Decision Day as the field hit the wire with one lap to go. The pair continued to slug out along the backstretch while Wilson kept Bangkok in touch with the leaders. When Melmich seized control as the field straightened for home, Bangkok responded and continued to cut into his advantage down the lane, eventually gaining the upper hand for the half-length win. It was also the fourth Valedictory crown for Wilson. She won the 2006 edition with Marsh Side, the 2012 running with Heathcote and guided Turkish to a victory in 2014. Gracey was happy to see his hard-knocking charge get rewarded with a stakes triumph. There were familiar names on top of the leaderboard at the end of Sunday’s 14-race season-ending card at Woodbine. Eurico Rosa da Silva, a Sovereign Award winner as Canada’s outstanding jockey in 2010, 2013 and 2015, won three races on Sunday’s card to finish as the leading rider with 202 victories, one more than his win total last year. It marks the fourth riding title for da Silva. Luis Contreras, three times meet’s leading jockey, finished second with 140 wins. Patrick Husbands had 101 wins. Mickey Walls’ classic 1991 record of 221 wins remains the most victories posted in a single meet. Mark Casse recorded his 10th straight training title and 11th overall, winning 97 races, after notching 80 wins in 2015. Casse recorded a record 119 wins in 2011. Casse also led in the purse earnings category, with $7,261,391 compared to $6,239,151 in 2015. Trainer Norm McKnight landed in the top five of the trainer standings for the first time finishing second with 59 wins improving on his 29 triumphs in 2015. Kevin Attard was third with 42 wins. Conquest Stables LLC led all owners at Woodbine with $1,962,352 in purse earnings, compared to $1,954,356 in 2015. Headed by Ernie Semersky and Dory Newell, Conquest Stables who won five stakes on the meet, also finished second in wins with 28, tied with Stronach Stables. On the the final card, owner and trainer Steve Philpott got his first win of the season with his lone runner, MAJOR PRODUCTION,a 6yo by Strut the Stage who won the 1 7/8 mile starter allowance, the longest race of the year. Major Production was 2nd in this exact race last year but he had been dull in all of his 6 runs this year. Jim McAleney rode the winner. LUTHIA SHIRLEY, who won 3 of 9 starts with her horses at Fort Erie this year, sent out WARLORD to a stunning 80 to 1 upset in race 7 for her first Woodbine win. Barrington Tomlinson owns the War Cry 4yo. Louisiana-based professional photographer MR STEVE QUEEN of HRN Horse-Races.Net is in Hong Kong for the Longines Hong Kong International Races at Sha Tin.